As temperatures drop, snow piles up and people’s minds turn to holiday celebrations, you may think that your house won’t sell. In fact, many people take their homes off the market during this time and wait for spring to relist them. Unfortunately, not everyone has the luxury of waiting. If you need to sell your home now, consider changing up what you’re offering. 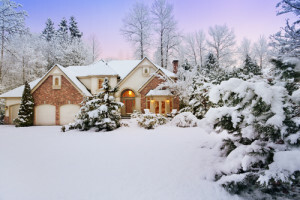 Especially in winter, a home’s location is important. So, if your home is near to public transportation access and major roads likely to be kept plowed or cleared, or conversely, it is near to winter sports and recreation, highlight those facts as selling points. Easy access to the places they want to go is one way to attract winter buyers. While a blanket of snow can cover a host of landscaping issues, make sure your home looks well cared for when buyers pull up to the curb. Make sure walks are clean, gutters are clear and the exterior is well lighted. Remove any debris or piles of leaves. You want your home to look well kept no matter the season. Add festive décor, such as a wreath on the door or greenery on your mantel, but don’t go overboard. To appeal to the widest possible audience, your decorations should be less personal and neutral. When house hunters visit your home in inclement weather, make sure to have a welcoming atmosphere in your house. Leave warm beverages or homemade cookies for them. Light fireplaces and candles. Make sure your home is warm, light and bright. While this is true at any time of the year, make sure your price reflects both the value of your home and the winter market expectations. People that need to buy and move during the winter months often have specific budget constraints. Otherwise, they might choose to wait for a more convenience time of year. Consider offering incentives or concessions for home improvements, closing costs, new appliances or other items to sweeten the deal for potential buyers. During the winter months, selling on your own may not be the best strategy. Professional real estate agents have access to several advertising channels. They more likely know how to highlight your home’s best selling points. Most of all, they have access to buyers such as those moving to your area for a new job, or investors looking to make a purchase before the end of the year. Knowing how to target the right buyer or investor is one of the many advantages a professional can bring to a home sale.